Home » What was the Ionian revolt? In 539 BC, Cyrus the Great made himself the King of Kings. He ruled all of West Asia. Along the coast of Anatolia (modern Turkey), Cyrus conquered the Lydians. Then he conquered the Greek cities that had been dependent on Lydia (LIH-dee-uh). 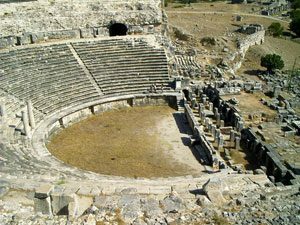 The people who lived in these Greek cities in Turkey called themselves Ionians (eye-OH-nee-ans). Cyrus and the Persians (the Iranians) made some changes in Ionia. They charged higher taxes and put in tyrants who were loyal to the Persians. So the Ionians were not happy. Cyrus’ son Cambyses conquered Egypt too, and some of the Greek islands between Anatolia and Greece. In 522 BC, Cambyses conquered the important island of Samos. When Cambyses was killed, Darius became king, and he wanted to conquer something too. Darius decided to attack the Scythians, to the north of the Black Sea. This may have been because of a victorious army problem. Or it might be because the Scythians were very rich and controlled a lot of trade routes. But when Darius attacked the Scythians, in the summer of 514 BC, he lost. The Scythians retreated, but they burned all their food before they left. So Darius’ army could find nothing to eat and was forced to go home to Persia. At this point, many Greeks thought that the Persians were going to attack Athens and Thebes and Sparta next. A bunch of Greek cities sent messengers to the Persians. The messengers said that the Greeks would do whatever the Persians wanted, and please not to attack them. For example, Macedon, a small kingdom to the north of Greece, made an alliance with the Persians about 510 BC. Athens seems to have been one of the cities that sent messengers to the Persians. (Though later they didn’t like to remember that they had been so scared.) But when the Athenians got to see King Darius, he was rude to them. So they decided not to make an alliance with the Persians after all. Also, when the Athenians threw out their tyrant, Hippias, he fled to the Persian court. Now the Persians were sheltering Hippias, which the Athenians didn’t like. The Persians, growing bolder, decided to attack the island of Naxos in 499. This force was led by Aristagoras, the tyrant of Miletus, who was very friendly with the Persian king Darius. He was Greek and his force was mainly though not entirely Greek. But after a siege of four months, Naxos did not fall, and the Persians had to withdraw.But now the Persians had lost two battles in a row: against the Scythians, and against Naxos. The Ionian Greeks started to think they really could win against the Persians. Later in 499 they decided (not all of them) to revolt. This is the Ionian Revolt. 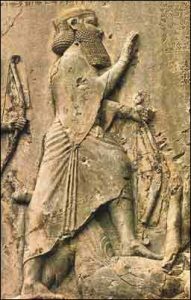 Aristagoras, who was afraid the Persian king Darius would be angry about his defeat, changed sides and took charge of the revolt (much to the Ionians’ surprise). Aristagoras deposed the other pro-Persian Ionian tyrants and set up democracies in their place. These were basically like the Athenian democracy (which had itself only just gotten started). Then he set off to ask for help from Sparta. The Spartans were never very interested in events in Asia, and they were always worried about helot revolts. They turned him down, so he went to Athens. Athens agreed to send a lot of her new navy — twenty ships. The Eretrians on Euboea agreed to send five ships. The Ionian Revolt at first went well. The allied forces captured and burnt the capital city of Sardis, though they did not capture the citadel. But gradually the Persians began to win. By 494 the Persians captured Miletus itself and killed Aristagoras, and the Ionian revolt was over. The Persians do not seem to have done anything very bad to the Ionians after the Ionian Revolt. They made treaties and agreements, set up new tyrants operating under clear rules, and renewed the taxes at the old rate. But the Persians were really mad at the Athenians and Eretrians, foreign terrorists who had invaded their country unprovoked and destroyed innocent people’s houses and killed people. The Greco-Persian Wars, by Peter Green (1998). Cite this page: Carr, K.E. What was the Ionian revolt?. Quatr.us Study Guides, July 7, 2017. Web. April 23, 2019.